Last time I talked about the death of one particular Great Gray Owl and how it impacted one listener. Sometimes wildlife managers and other people tell me that individual animals don’t matter—to protect species, we need to focus on populations, not individuals. But it’s quite possible for a person to focus on both, and the silly statistical argument that individuals aren’t the basis of populations grows increasingly ridiculous when a population dwindles to just a few individuals. Even in a robust population, individual lives have meaning. 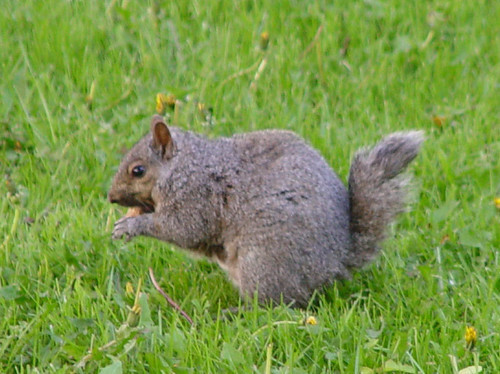 Back in the 1990s, one fall day my kids and I noticed a squirrel in the backyard whose tail had been ripped off—at least, all the fur and skin. The bones and muscle remained, kinked in a couple of places and clearly infected. By the second day the outer third or so had fallen off, but the rest of the tail looked horrible for at least a week before it finally fell off. Meanwhile, the squirrel looked weak and dazed. She would have been stressed if I’d tried to capture her—nature would have to take its course, but I could hardly let the poor thing die of starvation when she was too weak to search hard for food. The least I could do was to buy a bag of peanuts and another of mixed nuts. When I’d see her near our dining room window, I’d crank it open to drop half-opened nuts and a few peanuts on the ground. I also set out a dish of water for her, and kept it fresh. She had trouble climbing trees—I don’t know if it was simply getting used to balancing without a tail or her being weak while dealing with a massive infection. After the infected tail fell off, she was left with a short stump, so I started calling her Stumpytail. As she recovered from the infection, I didn’t want her to generalize about people being nice when she couldn’t get away from danger as fast as our other squirrels, so my kids and I never fed her out of our hands, but I got into the habit of keeping some nuts or peanuts in my pocket when I was in our backyard. I might be looking at an interesting warbler or finch up in my tree when suddenly I’d feel something tugging on my shoelace, and sure enough, there would be Stumpy looking up at me expectantly, so I’d drop a few nuts down to her. I treasured this one squirrel beyond anything I’d expected. There’s a saying, “Love is an active verb.” Maybe my specific actions of looking out for Stumpy when she was in trouble were what made me love her. Or maybe it was just that she stood out from all the other squirrels, giving her a particularity that mattered. Joseph Stalin once said that the death of one person is a tragedy; the death of one million is a statistic. And Mother Teresa said, "If I look at the mass I will never act." I had a genuinely special feeling for Stumpytail greatly beyond what I felt for the squirrel population on Peabody Street. We saw Stumpy just about daily for several years, and then suddenly, she stopped coming. I figured she had died and was broken hearted. 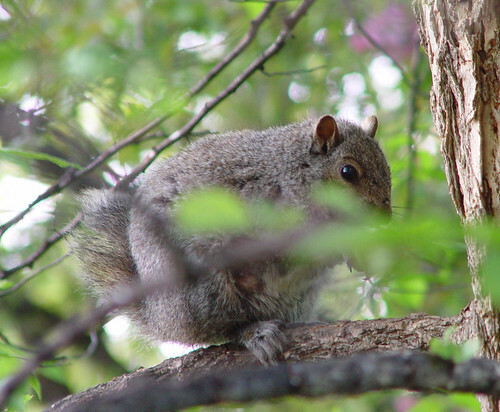 Several months later, I was driving home and when I turned down Peabody Street two blocks from home, there was a stumpy-tailed squirrel in someone’s front yard. I cranked down my window and said, “Stumpy! Why don’t you write?” I kept going, and suddenly noticed out my car’s outside mirror a little stumpy-tailed squirrel running along the sidewalk. By the time I’d parked the car in the garage and come into the house, there she was on my front porch, waiting expectantly. Life went back to normal with Stumpytail for the next couple of years. Then we had a snowy winter. One morning when I was out of town, Russ was shoveling the front walk and discovered Stumpy’s frozen little body—she’d apparently been sitting on the snowbank waiting for the plow to go by, misjudged, and got plowed under. Over the years, the individual animals—birds as well as squirrels—that I’ve helped, like my chickadee with the overgrown bill and missing toes, and all the baby birds I’ve raised, have elicited love or something awfully darned close to love. When my special chickadee raised a whole brood of chicks who fledged successfully, I was elated. When a baby flicker we’d raised went off in autumn, but alighted on my son the following spring, our whole family was overjoyed. One baby Pine Siskin was on death’s door from a cat attack. It recovered and flew off with Pine Siskins that fall. I was thrilled that it had fully recovered, and even more joyful when it returned the next spring and alighted on my little daughter Katie’s finger as she was riding her tricycle. Does caring so very much about these individuals detract from my work as a conservationist? Of course not. Having such a clear commitment to specific individuals whose paths cross mine makes me more fully aware of the challenges of life in this modern world for all kinds of creatures. When I can tell the story of an individual bird that was hurt in a preventable way, that makes my listeners more viscerally aware of the preventable dangers we humans pose to wildlife. Our human capacity for love and mercy is perhaps our greatest quality as a species. We may carry loving the particular to excess when we are mindless about the needs of the many, but the quality of mercy is not strained; It droppeth as the gentle rain from heaven Upon the place beneath, and if that place underneath has a Great Gray Owl or a hurt squirrel, that’s quite alright with me.